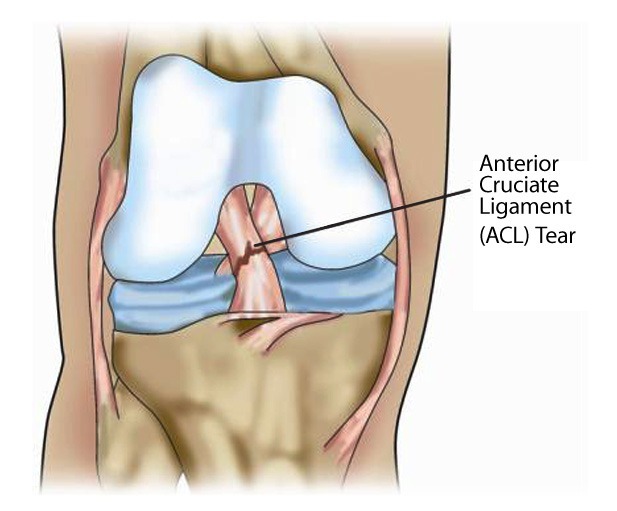 ACL or Anterior Cruciate Ligament tear is a common knee injury. Most athletes playing high impact sports like: Football, Cricket, Hockey, Kabbadi, Basketball etc., are prone to injure their Anterior Cruciate Ligament because of the overstretching of the ACL. The knee joint is a complex structure of bones, ligaments, tendons and other tissues working together. Ligaments, being strong bands of tissue, connect one bone to another and the ACL is one of the two ligaments crossing in the middle of the knee connecting your thighbone (femur) to your shinbone (tibia). It is the knee joint’s internal stabilizer. Its main function is to prevent Hyperextension, state where the angle between the body parts or joints is really high. ACL also has a secondary function to restrain tibial rotation and varus/valgus stress. Two wheeler accidents is another common cause of Anterior Circulate Ligament tears in Indian sub-continent. the same activity is restarted. DO NOT return to playing or exercising or running. In a physical examination, the doctor will check the injured knee for swelling and tenderness, comparing it with the uninjured one. The injured ligament will be subjected to clinical test and integrity will be assessed, and overall function of the knee will be tested. Warming up before playing will prevent injuries.